On the 21st February, Hills Football and Hills United FC hosted the inaugural Hills Football All Stars Charity Match in support of the John Maclean Foundation. The match, held in front of a crowd over over 600 at Valentine Sports Park finished 3-1 with Hills United FC the victors on the night. It was an entertaining match played in high spirits all for a great cause. The were plenty of chances for both teams in an end to end thriller. The community has managed to raise $5,475 for the event. John Maclean on the night confirmed Chris will be receiving his new chair in order to play Powerchair Football! 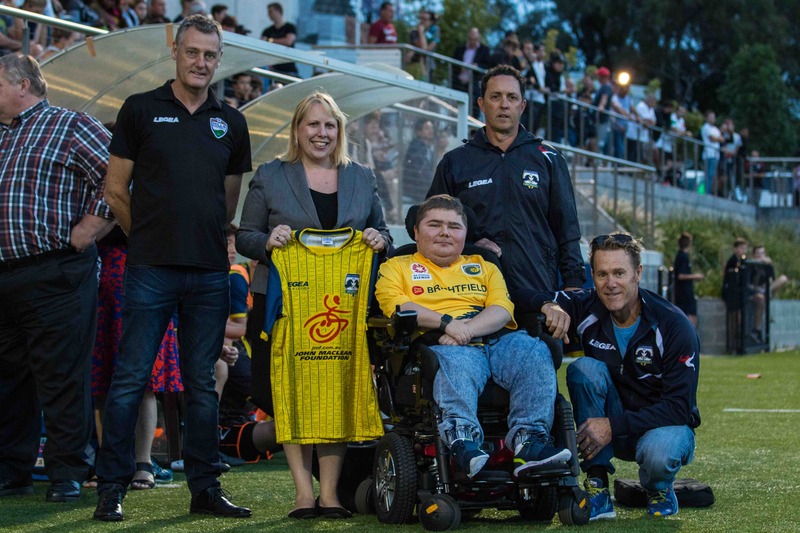 The John Maclean Foundation would like to thank Hills Football and Hills United FC, Hills Shire Council Mayor Michelle Byrne, Members of the NSW Powerchair team and everyone who came out on the night and supported the cause. We will be back in 2019 with hopefully some more age groups!